Karan Casey has long been one of the most innovative, provocative and imitated voices in Irish traditional and folk music. Singing songs charged with a sense of social responsibility in a career spanning over 25 years, Karan has released 6 solo albums as well as an album for children, a duet album with John Doyle and numerous contributions to other artists’ projects. She has toured constantly throughout North America, Europe and Japan, performing with her own band as well as collaborating with such diverse musicians as James Taylor, Bela Fleck, Boston Pops Orchestra, Liam Clancy, The Chieftains, The Dubliners, Peggy Seeger, Mick Flannery, Mícheál Ó Súilleabháin, Tim O’Brien, Solas and Lúnasa. Karan has just finished her year as Traditional Artist in Residence at University College Cork and in 2017 has performed at Glasgow’s Celtic Connections, toured the UK with the Transatlantic Sessions and toured in the US both with her own band and with Lúnasa (including a performance at New York’s Carnegie Hall). She is currently working at a new album with producer Donald Shaw to be released on the Vertical Records label in 2018. Over the past 25 years Niall Vallely has established himself worldwide as one of Ireland’s most significant musicians and composers. Born in Armagh in 1970 he began learning the concertina at the age of seven, taught by his parents Brian and Eithne Vallely, founders of the Armagh Pipers’ Club. Over the years he has developed a unique approach to playing the instrument and his compositions have gained widespread acclaim both within the world of Irish traditional music and further afield. A resident of Cork since 1988, Niall completed a degree in music at UCC in 1992. After college Niall embarked on a performance career, touring throughout the world and recording with the likes of Nomos, Buille, Karan Casey, Paddy Keenan, Tim O’Brien and Asturian band Tejedor and recently Jazz legend Cassandra Wilson. Since the early 1990s Niall has been working at composing traditional-style tunes. His tunes have been recorded on more than 75 albums while some of them have become ‘standards’ in sessions throughout the world. In more recent years he has been expanding the scope of his compositions to embrace larger scale forms and instrumentation and involving musicians from the worlds of traditional and classical musics. He has received commissions from RTE LyricFM, BBC, TG4, Cork Opera House, Crash Ensemble, University College Cork, Kate Ellis and the Vanbrugh Quartet and has had his works broadcast on radio and television in Ireland, the US and throughout Europe. Niall has also been involved in arrangement projects with artists including Lúnasa, Iarla Ó Lionáird, Donal Lunny, the Boston Pops Orchestra and the RTE Concert Orchestra. Niall was appointed Traditional Artist in Residence at University College Cork in 2014 and in 2015 published a book of his tune compositions “Malfunction Junction – 101 tunes”. In the past couple of years he has released albums of new compositions with Buille and with the Irish/Scottish/Scandinavian collective The Secret North and had premiere performances of new music at Liberty Hall, Dublin and the Market Place Theatre, Armagh. Caoimhín Vallely first came to prominence as fiddle player with the Cork band North Cregg but has emerged in recent years as one of the most interesting and individual piano players on the Irish music scene from his work with Buille and with singer Karan Casey. Caoimhín began tin whistle lessons at the Armagh Pipers Club as a young child before moving on to the fiddle with his mother Eithne. At the same time he began going to classical piano lessons with local maestro Romeo Forte and after a while started experimenting with traditional Irish music on the piano. On leaving school he went to study music at University College Cork and on completion of a B.Mus degree moved on to the University of Limerick where he completed an M.A. in Traditional Music Performance under the tutelage of among others Prof. Mícheál Ó Súilleabháin. He has played and recorded with many different bands and individuals over the years including Brian Finnegan, Kathryn Tickell, Nomos, Dónal Lunny, Paddy Keenan, Mícheál Ó Súilleabháin and Mel Mercier, Mick Flannery, Paddy Casey, and Cormac Breatnach. In recent years he has developed a deep interest in related European folk musics and has also performed and recorded with Jean Michel Veillon and Jacky Molard (Brittany), Duo Lagrange Rutkowski (Central France), Tejedor (Asturias), La Musgaña (Spain), and Dàimh (Scotland) among others. In 2005 he released to universal critical acclaim his debut solo piano album – “Strayaway” – which is still one of the very few albums of traditional Irish music on the piano. He is a co-founder and current member of the group Buille, with whom he has recorded three groundbreaking albums. 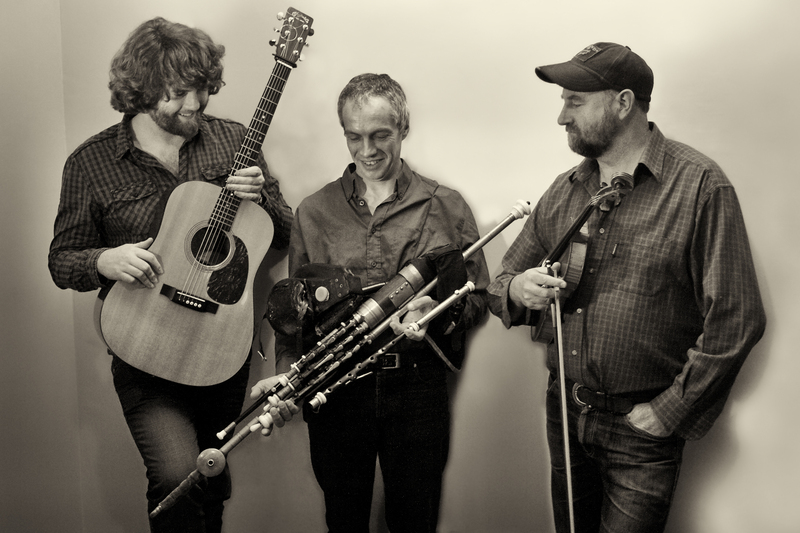 The band have toured all over Europe and the USA and have performed alongside such luminaries as Béla Fleck, Martin Hayes, Aoife O’Donovan, Máirtín O’Connor and Michael McGoldrick. Siobhan O’Donnell est née dans le Comté de Sligo, dans l’ouest de l’Irlande. Dès son plus jeune âge, elle a appris la musique et le chant au sein de sa famille, et surtout auprès de son père Colm, une légende du chant traditionnel du South Sligo. Elle apprend le fiddle et le whistle quand elle a 9 ans, mais devient aussi une brillante guitariste et joueuse de bodhran, instrument avec lequel elle gagne un titre de All-Ireland Champion en 2005. Elle commence alors à écumer tous les festivals d’Europe avec le groupe The Border Collies. Elle émigre en Australie en 2010, sous l’égide de l’Irish National Association, pour promouvoir et enseigner la musique irlandaise, et s’installe à Londres en 2013 pour poursuivre sa carrière d’enseignante et continue de jouer en duo sur la scène folk, c’est à cette période qu’elle croise la route de Loïc. Siobhan vit désormais à Dublin; lorsqu’elle n’est pas en tournée, elle se produit en concert dans la capitale. Son dernier album, ”Beautiful Affair”, a été salué unanimement par la critique outre-Manche. Siobhan O’Donnell was born in Co. Sligo in the West of Ireland, an area steeped in traditional Irish music and song. She grew up at the foothills of the Ox Mountains alongside the border of Co. Mayo. From an early age she was exposed to the finest music and song, coming from a family steeped in tradition with her Father Colm being widely recognised as being one of Ireland’s greatest exponents of traditional singing. Siobhan played music from the age of nine, learning tunes on the whistle and fiddle. She was greatly influenced by the South Sligo style of traditional music and song and has had lots of success, winning All- Ireland titles in Singing, Lilting and was crowned Senior All-Ireland Bodhran Champion in 2005. Siobhan joined the group The Border Collies, with her Father Colm and had great success in performing at music festivals across Ireland and Europe. As well as being a seasoned performer, Siobhan has taught workshops at music schools and festivals across the world, such as South Sligo Summer School (Tubbercurry), Joe Mooney Summer School (Drumshanbo), Craiceann (Bodhran School, Aran Islands), Ceol Aneas (NZ), National Folk Festival (Australia) to name but a few. In 2010, Siobhan emigrated to Australia when she was commissioned by the Irish National Association in Sydney to promote Irish music, song and culture in the region. She set up a music school for adults and children and performed at folk festivals across the country with her band, The Shamrock Sheilas. In 2013, Siobhan moved to London to pursue her teaching career and continued to perform in duo acts on the London folk scene. Siobhan remarks on how she has now ‘happily’, returned home to Ireland and lives in Dublin. When not on tour she can be found performing at gigs across the capital. Kieran Munelly is a young flute player and percussionist hailing from the west of Ireland. Although at young age Kieran has been performing professionally coming up on 20 years. Most recently Kieran has started performing with The Young Irelander’s, they are set to tour the World, starting with an upcoming 5 month US tour in the Autumn. He has toured with larger stage productions such as Women of Ireland, where he was Assistant Musical Director. He remains to keep his musical collaborations alive and vibrant, most recently with a music collaboration with six musicians from Scandanavia, Scotland and Ireland. The project is called “The Secret North”, album due for release in the Autumn. Kieran released “In Safe Hands” with Aidan O Donnell (tg4 young musician of the year 2010) to critical acclaim.He continues to work on the live circuit with some of the freshest talent on the Celtic/folk/roots scene, and despite basking amongst the success of today’s best known traditional musicians, Kieran has by no means reached the peak of his career. Punch, feeling, swing, voilà des mots qui vont faire grincer des dents les fervents défenseurs de la langue française mais ce sont ceux qui définissent le mieux le jeu de ces trois musiciens. La musique qu’ils interprètent est puisée dans le vaste répertoire de musique traditionnelle irlandaise. Le concert qu’ils proposent se compose de mélodies anciennes ou contemporaines, de compositions des musiciens du trio et de quelques chansons irlandaises. Il sont tous trois membres de groupes renommé, An Eitre, Avalon, Gwendal, Mugar, Taxi-Mauve, Poppy Seeds, ont accompagné des artistes comme Zazie, I Muvrini ou Gilles Servat, mais considèrent que le trio reste un principe intéressant qui permet de mettre en valeur le style particulier à chaque musicien et autorise plus de liberté musicale. 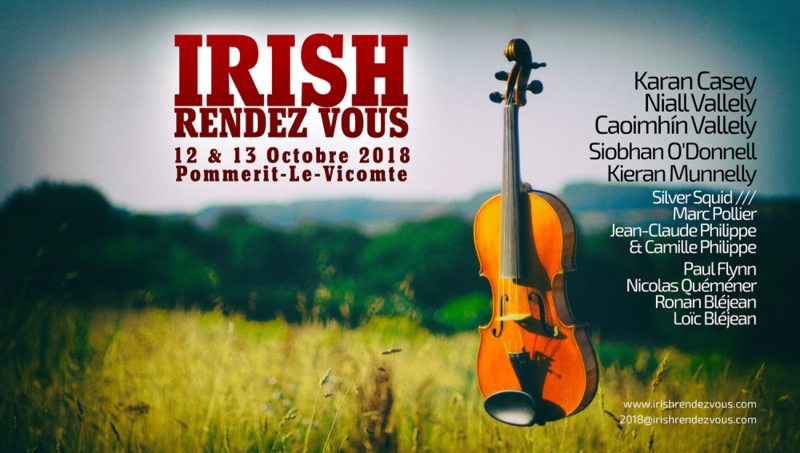 Jean-Claude PHILIPPE joue du fiddle depuis plus de 30 ans dans le style « Sligo », un jeu particulier à cette région d’Irlande qui a pour caractéristiques la vivacité, de nombreuses ornementations (rolls, triplets, slides, …) et beaucoup de recherche dans l’expression. Marc POLLIER pratique le uilleann pipes depuis 30 ans. Il perfectionne son style directement auprès de musiciens irlandais qu’il rencontre. 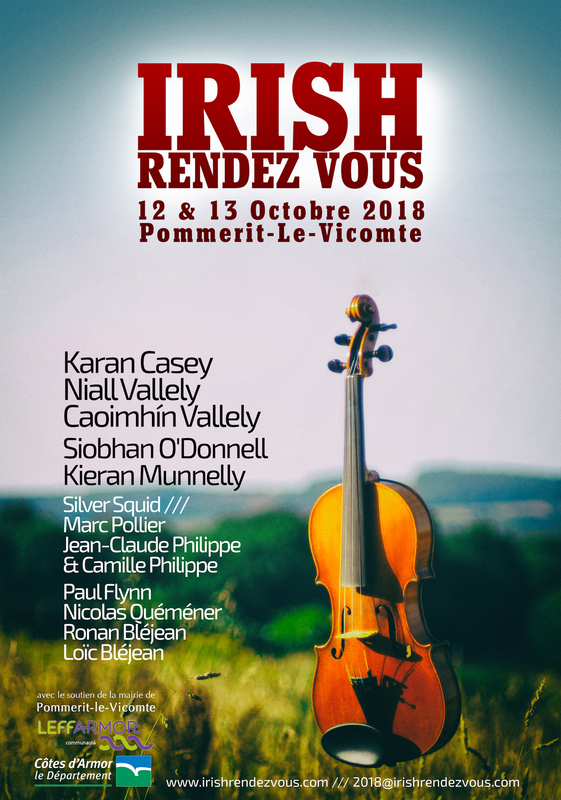 Sa virtuosité en fait un musicien très apprécié en Irlande où il séjourne pendant 6 ans, jouant et enregistrant avec de prestigieux musiciens (Siobhan Peoples, John Kelly, Tola Custy …). Camille PHILIPPE offre l’accompagnement coloré d’une guitare qui se veut à la fois rythmique et expressive. Il renforce chaque nuance de la mélodie et en explore toutes les possibilités harmoniques. Il apporte la fougue et la spontanéité de sa jeunesse au jeu expert et « sans coutures » du duo fiddle-pipes. Il pause sa voix chaude, carressante ou tonique sur des chansons d’origine irlandaise ou américaine. Quand on fait tourner les reels, jigs, hornpipes, polkas et slides comme ils savent le faire, ce n’est plus seulement affaire de technique mais d’esprit. Ce trio fusionnel présente une musique fluide, rythmée, naturelle à l’image du calmar ( squid ) qui se déplace en un mouvement de va-et-vient régulier et coordonné avec les autres individus d’un même groupe. Le trio apprécie tout particulièrement l’intimité et l’ambiance des cafés concerts où ils retrouvent l’atmosphère détendue des pubs irlandais. Pour eux, la musique est un moyen d’expression mais aussi de relaxation, comme pour les bluesmen par exemple. Aujourd’hui, l’impact et la communication sont considérés comme essentiels et parfois, les gens oublient que le musicien joue aussi pour son propre plaisir. Néanmoins ce plaisir, ils vous le feront partager lors de leurs concerts. La musique irlandaise est l’une des plus belles du monde, l’émotion qu’elle procure révèle tout ce qu’il y a encore de sensible, de romantique et de généreux en nous. L’interprétation qu’en fait le trio allie une musique jeune et dynamique à une tradition bien vivante.